Our research in biomimetic crystallization has taught us that crystallization processes are not well understood in real systems; the classical models of the 1920’s work exceptionally well for simple model systems (i.e. melts, NaCl, etc.). But even simple additives, such as polyacrylic acid, can intervene in the crystallization process and trigger so-called Nonclassical Crystallization processes. These processes i.e. oriented attachment, prenucleation clusters, and liquid-condensed mineral precursors (PILP) question our current understanding of crystal genesis and growth. The third member of the nonclassical triumvirate is the so-called Polymer-Induced Liquid-Precursor Process (PILP), a process which has pronounced morphosynthetical potential. It proceeds in a colloid-mediated fashion via a liquid-phase amorphous intermediate. 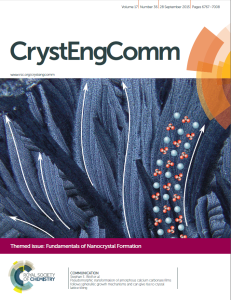 By addition of inhibitors like poly-aspartate or selected biomineralization proteins, classical nucleation of a solid crystalline phase is suppressed which, in turn, promotes the formation of a liquid-condensed phase of mineral precursor. This unusual ion-enriched liquid-amorphous phase becomes the crucial agent of the precipitation reaction; the process of mineralization is converted from a solution crystallization process to a pseudomorphic solidification process. This change of pathway provides an efficient means to synthesize an impressive multitude of mineral morphologies, many of which mimic the features long considered enigmatic in biominerals. Biominerals, such as sea urchin spines and mollusk shells, are biogenically formed composite ceramics which show superb adaptation for given tasks. The 542 million years of evolution since the Cambrian explosion has rendered biominerals an immense source of inspiration for both material design and for the creation of ceramic materials at ambient temperature. The key step during genesis of these biogenic ceramics is the controlled solid-amorphous to crystalline transformation from a transient precursor to a highly co-oriented mosaic crystal. We are interested in structure-property relationships in biominerals which may lend additional functionality to biomimetic materials or which are able to enhance the properties of man-made materials. Further to this, we investigate the self-organization processes which underlie biomineral formation in order to elucidate the fundamental processes which give rise to characteristic structural motifs, especially on the nanoscale. For instance, we recently provided the first evidence for a nonclassical mode of growth of nacre in bivalve shells. 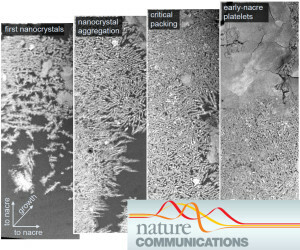 This finding, published in Nature Communications, strongly interlinks the emerging field of nonclassical crystallization — n.b. our first research area— to the biomineralization realm — our second field of research — and underlines its importance for future biomimetic approaches.